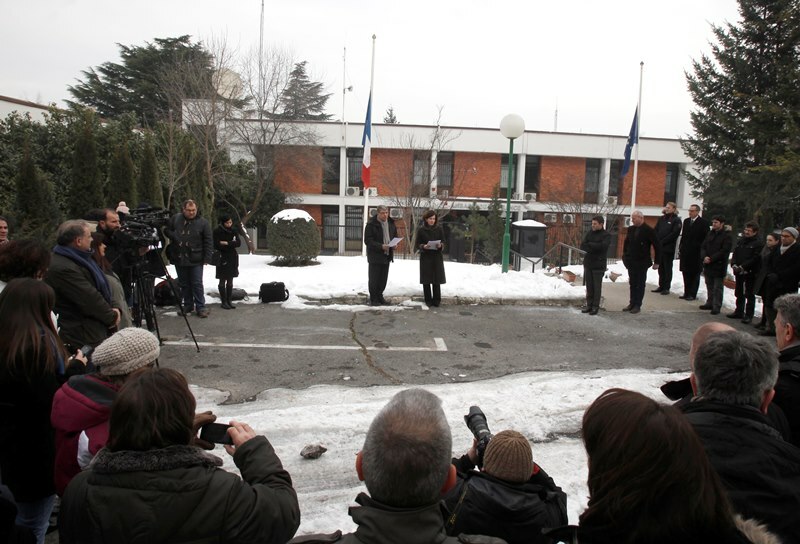 Skopje, 8 January, 2015 (META) – Homage for the killed in the terrorist attack on the weekly “Charlie Hebdo” in Paris was held today at the Embassy of the Republic of France in Skopje. Ambassador Laurence Auer said that today is a national day of mourning in France and in diplomatic and consular missions of their country. She dismissed yesterday’s attack as a cowardly attack and insidious act, in which 12 people were killed. – Famous cartoonists from French press, journalists, employees and two policemen were among the victims. They fell from the bullets hatred and intolerance. In France, “Charlie Hebdo” embodies the freedom of expression on all possible topics. Intellectual provocation is essential in the building of our thought, our democracy. Drawing, humor is an expression of a fundamental right – freedom of opinion. By attacking “Charlie Hebdo” because of its views, the attackers want to intimidate us, to freeze our thought in order for us to abandon the idea of freedom today and the idea of democracy tomorrow. We don’t accept this savagery, we will never yield to intolerance, to terrorism. 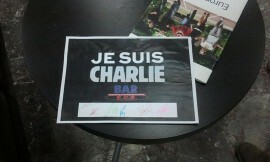 Everywhere in the world, French citizens and holders of democracy are raising their voice to express it. 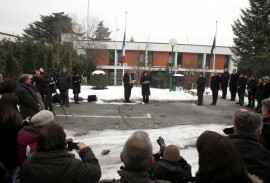 I would like to pay homage to Charb, Wolinski, Tignous and others that fell from the bullets. 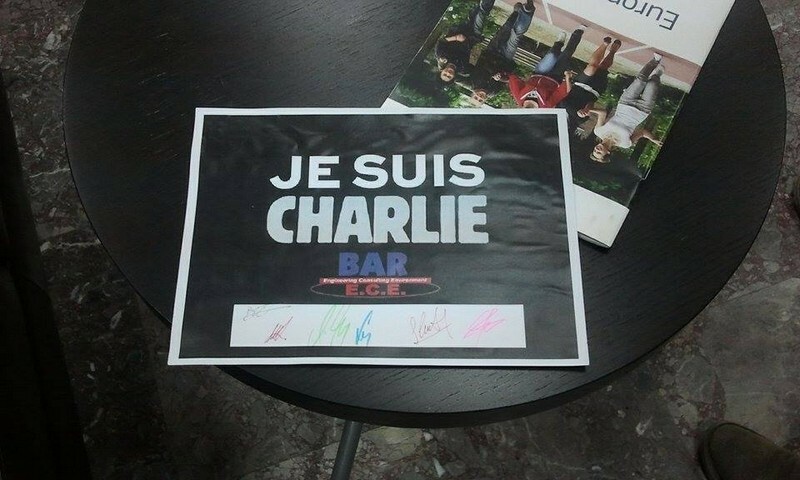 We are Charlie – said Auer. 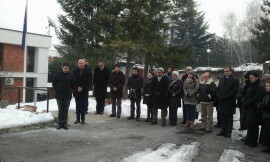 The homage was attended by representatives of the journalistic community in Macedonia, who signed the condolence book. Tamara Chausidis from the Independent Union of journalists and media workers said that journalists in Macedonia are united in compassion. 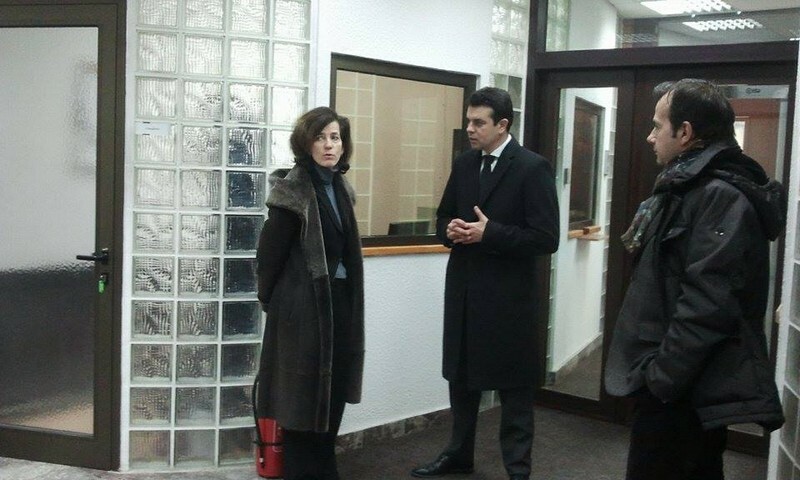 – Macedonian journalists are not strangers to pressure and suffocation of freedom of expression. But, what happened in Paris is really a barbaric act that shocked everyone and at times left us lost for words, in condemnation of what happened there. It is regrettable that after decades and centuries of French Revolution, it is shown that the idea of freedom still requires struggle and still requires disobedience. We remain united with our French colleagues as media community in that disobedience to fight for freedom of expression – said Chausidis. Naser Selmani from the Association of Journalists said that this is a sad day for all journalists in the world. – Not only for journalists, but for the entire free world. Yesterday there wasn’t an attempt to kill freedom of speech, but there was an attempt to threaten the free world. We are not convinced that the ideal of freedom will triumph over barbarism – said Selmani. Source: Meta.mk. (08.01.2015). 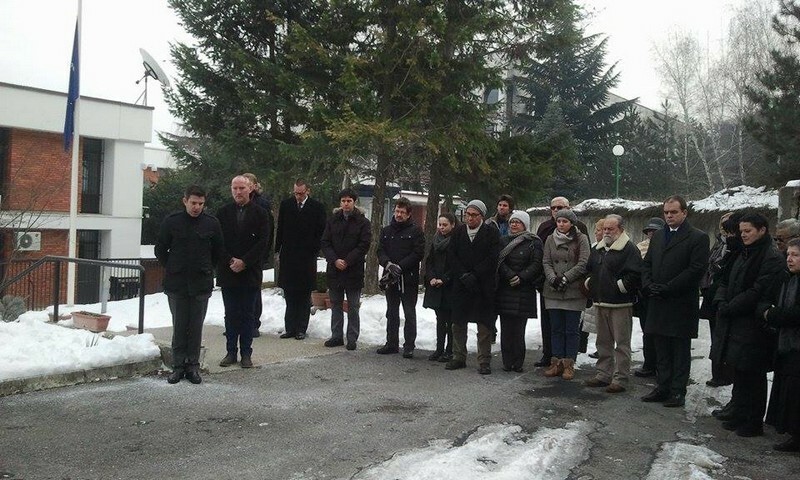 Homage in the French Embassy for the victims in Paris.